“The work perhaps began in 1997, when I was making Goin’ Back (The Birds/The Byrds x 32 + 1), and in a way it’s a version 2 of that work. It was Goin’ Back which began my process of combining unrelated sources via the device of a shared name or some other conceptual connection (which, by the way, I have since discovered is a classical rabbinic method of interpreting scripture). 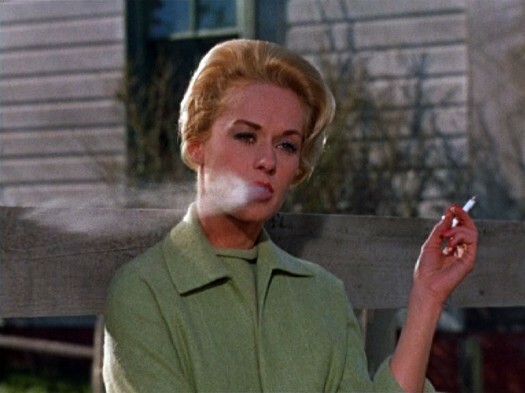 I’ve always loved Hitchcock’s extended scene of Tippi Hedren sitting smoking as The Birds gradually gather behind her, and I knew I wanted to work with it one day. 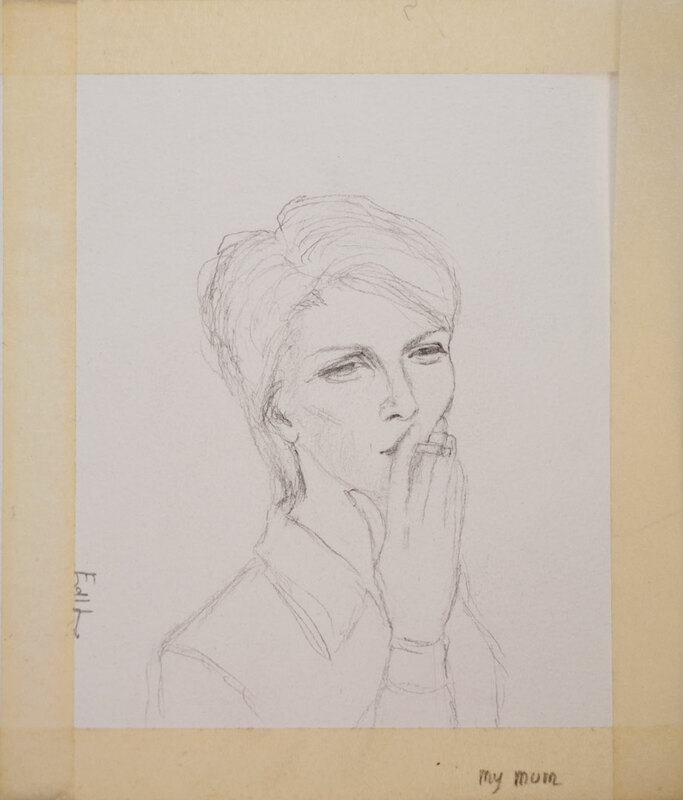 Then last year I bought a beautiful little drawing by Emmanuelle de la Lubie that I saw in her studio, of a woman smoking, entitled ‘My Mum’. 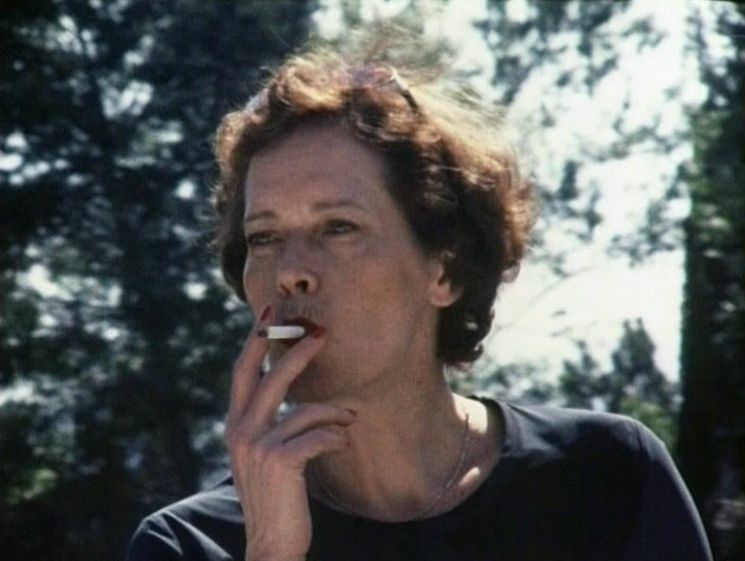 Then just the other day I saw Manon de Boer’s film of Sylvia Kristel smoking (at the South London Gallery) and my heart started to burn within me (that is always the real catalyst for creative invention, I find) and I thought, right – that’s it – I’m going home to make that work I’ve been thinking about for so long. First I cut out the scene from ‘The Birds’, and edited it to leave just the shots of Tippi Hedren. Then I started to play around with some music, as is my custom, and eventually dug out a little sound piece that I had made last year for Andy Holden’s artist’s music festival ‘Be Glad For The Song Has No End’, where I had been asked to DJ. I remember at the time I felt I had spent far too long making this music, because it wasn’t really art – it didn’t have enough conceptual rigour to it. It consisted of the intro to David Bowie’s ‘Memory of a Free Festival’, which I segued into Lou Reed’s ‘Berlin’, which I then mixed with The Field Mice’s ‘Sensitive’. It sounded good, but I didn’t know what it meant. When I put this on the audio track of the edited video, and played it back, I liked how they worked together, but I still didn’t know what it meant. In order to find out, I had to compromise with my own sense of how art should be made – to let it manifest itself, without any prior conceptual justification. As I watched it, I first noticed that the sound and the image began to make formal sense, as choreography. Then I began to see that this choreography performed a narrative that could be read in relation to my mother’s life. My mother? Let me tell you about my mother. She grew up in the war, a time that damaged a lot of people. I remember her telling me about the V2 bombs, how scary they were, and how she missed her father who was in the Air Force. After the war she was engaged to a pilot, and a few days before their wedding day he was killed in a plane crash. When she found out, she didn’t stop screaming until the doctor was called and gave her a shot. I don’t think she ever had any other support in coming to terms with her loss. The vicar just told her she had nothing to do with the funeral because they had not been married. She never had anything to do with the church after that. Later in her life she tried to commit suicide, and suffered an extended period of severe mental illness. She basically pulled herself through on tenacity and cigarettes. She was a beautiful woman.